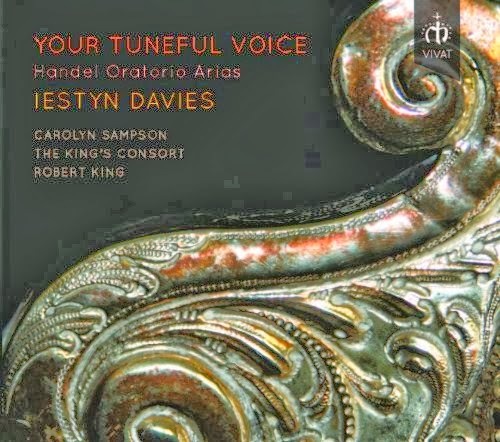 The latest release on Robert King’s Vivat label is a collection of arias from Handel’s oratorios sung by countertenor Iestyn Davies. The project is a great idea for many reasons, not least of which are the music’s relative underexposure and its undeniable quality. Davies has the ideal voice for Handel, and the King’s Consort gives him colourful but sensitive support throughout. Add to that excellent recorded sound and elegant packaging, and the result is a very attractive album indeed. Davies’ tone is both warm and pure, attributes rarely associated with countertenor voices. His diction is excellent, allowing every word to come through clearly (though they are all in the liner too if you miss any). He tends toward a very slight vibrato at the end of held notes, but it’s a tasteful device, whatever its historical veracity. Despite his always smooth legato, Davies clearly defines every note, his tuning always spot on, and his choice of attack always appropriate. Handel occasionally sets him up in duets with woodwind soloists, and the combination of tone colours is always ideal, differentiated enough for clarity, but also similar enough to allow the ensemble to cohere. Similarly, the soprano Carolyn Sampson duets with Davies in two numbers, and again the combination of timbres, and the balance between the voices, is finely judged. A detailed orchestra list is included, even stating the makers of all the instruments used. If this represents the permanent constitution of the orchestra, then the King’s Consort is approaching All-Star-Cast status. Just to give a few of the big names here, the leader is Kati Debretzeni, the seconds are led by Matthew Truscott, and the trumpets and horns are led respectively by Crispian Steele-Perkins and Anneke Scott. Yet, for all these world-class performers in the ensemble, there is never any danger of Davies losing the limelight. Even the brass section gives him the space he needs, although there are plenty of orchestral expositions and interludes in which the instrumental soloists can shine. Robert King presents Handel’s oratorio music as warm and euphonious. Despite the lack of vibrato, the string section always has a round and highly unified sound. Recorders are used instead of flutes, which may or may not be appropriate to the era, but also increases the tonal warmth and homogeneity. In fact, historical verisimilitude is clearly a major concern here. The liner note, by Donald Burrows, conjectures about the possibility that male falsettists would have performed in Handel’s oratorios, although he concedes that there is no direct evidence they did. Less edifying is the claim in the booklet that the King’s Consort perform “on authentic instruments.” Without digressing too much about just how meaningless those words are, it is a great shame that an ensemble that is clearly a world leader in the field chooses to describe its activities in terms that have been discredited since at least the 1980s. That aside, this is a very satisfying listen. A case could certainly be made for performing this repertoire in a more angular style, making the drama in many of the lyrics a bit more explicit. But King and Davies demonstrate that Handel’s music doesn’t need that kind of help. And even if they lay off the histrionics, they still provide plenty of musical variety to keep the listener’s interest.